…Indeed this is a beautiful thought, a precious declaration of gratefulness and peace at one’s surroundings and lot in life. To be honest it is not always the way reality seems to be for us at all, and life can sometimes be the complete opposite. Trust me, I know! Maybe when you think of the ‘lines’ of your life you imagine the perimeter of your homestead or dwelling place, and you wish it were larger, or smaller, or cleaner, or quieter, or richer, or safer? Some of you may think about the place where your lines fall and wish it were in a different location, or a far more appealing place? There may even be people dwelling within your boundary lines that are absolutely driving you crazy, or letting you down daily? Per chance even some of you are thinking of someone right now who you wish was able to dwell within your boundary lines but instead they are either far away geographically or even distant emotionally? Whatever your situation, wherever you find your lines to be or not to be, there is still a place for you where beauty can touch your heart and somehow kiss your life with peace; hang in there with me! Some synonyms of ‘pleasant’ are ~ Blessed, agreeable, darling, delicious, delightful, delightsome, dreamy, dulcet, enjoyable, good, grateful, gratifying, jolly, fair, comfortable, nice, sweet, pretty, satisfying, welcome, tasty, palatable, overflowing, or abundant. A person is ascribed the compliment of being ‘pleasant’ when seen to have qualities that tend to give pleasure, or when they act agreeably. You may also be characterised as being ‘pleasant’ if you have pleasing manners, behaviour, and a pleasant appearance, being easy on the eye! David, the writer of Psalm 16, where the first line of my story is taken from, lived much of his life as a fugitive. At times he was on the run like a wild animal trying to save himself from an enemy who was viciously trying to kill him. He often found himself in some very difficult places during those years. Sometimes life was so hard that he quite literally sank into a horrible pit, unable to be rescued or even try to rescue himself. Many of us have been there or are living there now. Other times he lived enclosed in complete darkness in lonely caves. But believe it or not, it was out of these experiences that David wrote some of the most meaningful words of his writing career; with God as his motivator, editor and publisher! each individual family was given a special place. The lines were drawn and the boundaries were made. Boundary stones were used as markers to show where the lines had fallen for each family, and every person knew the exact piece of land God had given them. So they lived in security and safety, provided for by God. So how can David declare this, when we can see his life is a mess by comparison? Could it be true that David wrote these words against the backdrop of the knowledge of those great promises that had been given to him by God? Many have studied this passage and believe it to be so. He said it by faith. David knew the God he trusted, he reminded himself of all the promises that had been spoken to him over the years, and one day he would see all that God had whispered to his heart in the darkness of night. Although David lived on the run and in fear for his life, in his heart he had moved his residence to a land called “Pleasant Places”. He moved in and unpacked his troubles and cares there, in the place of protection. 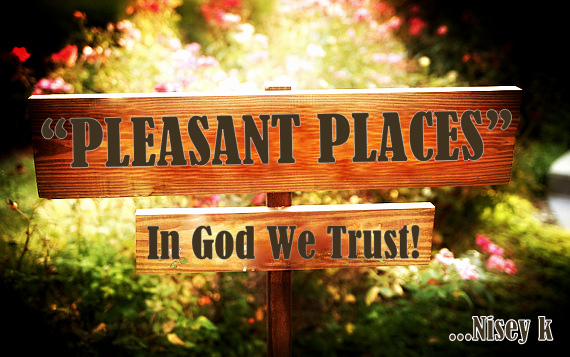 He came to find out that his new abode “Pleasant Places” was the place of provision. All that had changed about his circumstances happened in his heart, in his mind and in his relationship with God. 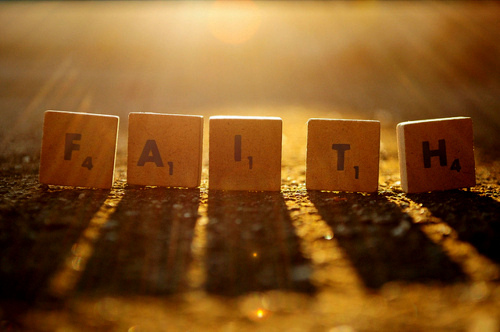 He began to believe in what God said and he declared it over his life. Soon even his difficult circumstances could no longer rob him of the peace that he found in “Pleasant Places”. I too am learning this…I have many desires and dreams waiting for the touch of God upon them, but one thing I have found is that there is a land in my heart that is mine, where God and I talk. And although I do not understand His timing or his workings in my life, I do know that I must trust Him in this place. By making a decision to declare that the boundaries of my life have fallen in “Pleasant Places”, I will lie down in peace, I will rise up in protection, and I will come and go in His provision and providence. There is a land I can live in where faith rules over my fears, where joy overcomes my sorrows, where tears are wiped away with the gentle touch of His hand. My dear friend, whatever season we may be walking through, it is an opportunity for us to learn something about God and to have an experience with Him that can literally bring a song out of our tired hearts. Even in the waiting time we can cultivate the hope that as we surrender and trust Him, we will come to realise that the “Pleasant Places” He has promised us resides within us! I have decided that wherever I find myself, wherever I lay my head, (or my hat), whether rich or poor, whether happy or sad, I will declare it a “Pleasant Place” because He is with me and He makes it PLEASANT! Speak these words softly to your heart . . .every day if you need to . . .
“The lines have fallen to me in pleasant places; Indeed, my heritage is beautiful to me. I will bless the LORD who has counseled me; Indeed, my mind instructs me in the night. I have set the LORD continually before me; Because He is at my right hand, I will not be shaken.
. . . come on, it’s time to unpack! SO needed this today…thank you sweet friend for sharing your heart and God’s truth! Love you! Thanks Ron….for your honest response! May you find Him to be your ALL and your very Great Reward…I too am learning that any strength in me is truly because of HIM….Bless you! Thank you my sweet friend! You have such a way with words, beautiful! I know it comes from your beautiful heart!! Both of us know that that is the desire of your heart and you are doing just that. We always feel the love of the Father and His Holy Spirit instructing our hearts when we read your inspirational posts. He is working through you chickie!